Well, if you follow young adult fiction even the tiniest bit, or if you’ve been reading any book blogs lately, you’ll probably know that this past Tuesday was the release date of “Mockingjay,” the final book in Suzanne Collins’ hit young adult series, “The Hunger Games.” I got myself a copy as soon as humanly possibly and hunkered down early, early, early Tuesday morning to read it before I could see any spoilers (which, honestly, I still haven’t seen any in inappropriate places). It left me feeling…mixed. If you really want to know you can read the spoiler-full review I posted on Friday. After I finished “Mockingjay” I had a really, really difficult time reading. I picked up one book on Tuesday and read about 15 pages, and then never picked it up again. A couple more books got picked up, looked at, and put back down. I finally was able to settle on Sean Ferrell’s “Numb,” but even that took me much longer to read than normal, considering it was under 300 pages and a quick read. Although I couldn’t read, I was able to listen to audio, and when I stayed home from work with a bad headache on Thursday I pretty much laid in bed and listened to my Sara Paretsky’s “Body Work” for 4 or 5 hours. I think I finally got back in the swing of my reading with Jessica Francis Kane’s “The Report,” which I started late Friday night and finished early Saturday afternoon. It was fabulous, so look for my review on Tuesday. I know, I know, they are strangely blue. I also want to say, yes, I may have technically finished 6 books this week, but “The Rembrandt Affair” and “American Music” were both nearly done at the beginning of the week, and “Body Work” was an audio. Plus, I read “Mockingjay” straight through in the middle of the night. It still ended up feeling like a slow week because after early Tuesday morning I didn’t finish anything else until Friday night. I always have a hard time picking up a new book after reading a book that I have been anticipating for awhile. I haven’t read The Hunger Game books so I didn’t read your post on these but I can understand having a hard time figuring out what to read next..and picking up and putting books down. Hope you have a great week of reading! Once in awhile a book rocks your world (sometimes in a good way and sometimes bad) that I have to take a break. The Angel’s Game did that too me, as I remember. 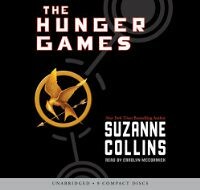 I just received Mockingjay (audio) in the mail, and hope to get started with that soon with my kids. Had a lovely time in Chicago, now back to reality for another week. Can’t wait to see you! It’s strange how reading certain books requires a tiny break after finishing. Sometimes it’s because the book is so good, sometimes because it is so bad, and sometimes it’s just that the book won’t stop niggling at your brain. I’m glad you found a way to get out of the post-Mockingjay slump. I finished Mockingjay at about 1:45AM this morning. I wasn’t going to read it yet, but then I figured, why the hell not?! I thought it was great, although there were a few minor issues for me. I need to read your review! I have yet to read Mockingjay so I won’t be clicking on your review yet. But I’m looking forward to it. I’ve had that same experience after getting to a book I had waited to read. I think, for me, it was The Girl Who Played With Fire, which I finished earlier this month. Since then, my reading definitely has diminished. I know what you mean about being intensely invested in a book — it can be hard to turn to another book right away.